What will Lego think of next? I had a chance to get a look at their Rockefeller Center store a few days before it opened and BOY is it COOL! A wall of Legos, a variety of sculptures mostly specific to NYC and a computer station where people can print out inspiration for designs – yes, this store has it all. WHAT: Free, three-day collaborative build of a 16-foot tall by 12-foot wide BIG APPLE – the iconic symbol for New York City – made entirely of LEGO Bricks to celebrate the grand opening of the LEGO Store at Rockefeller Center. Building tables and hundreds of visitors surrounding the ice rink, helping LEGO Master Builders build massive LEGO topiaries and a Big Apple over the Channel Gardens. WHEN: Tuesday, June 29th – 8am – 6pm – New York Yankee, Nick Swisher, will lay the 1st brick at 8am. 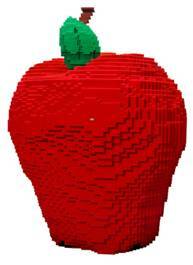 Thursday, July 1st – 8am – THE LAST BRICK will be placed on the apple at 3pm on Thursday July 1st! Click on the continue reading link to see a MILLION pictures of the store!! You won’t be disappointed. Oh my gosh, that is the coolest freakin’ thing EVER. My son would go crazy over that. So now if I ever get to the city, I will HAVE to bring him along. The kid eats, sleeps and breaths Legos (and airplanes). LOL You have no idea how lucky you are to live so close to NYC! yes – that store is going to have a TON of NYC specific stuff only available for purchase there.